I had good reason to miss the 2012 AGS meeting as the dates overlapped with Victory Day in Moscow. 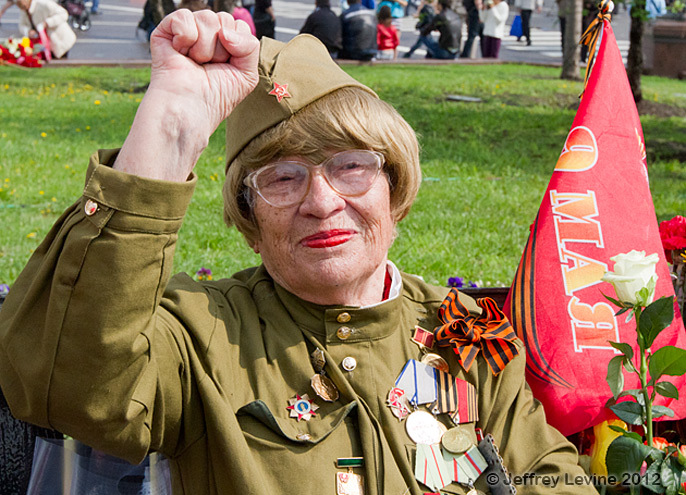 Victory Day is the Russian national holiday commemorating surrender of the German army on May 9, 1945. 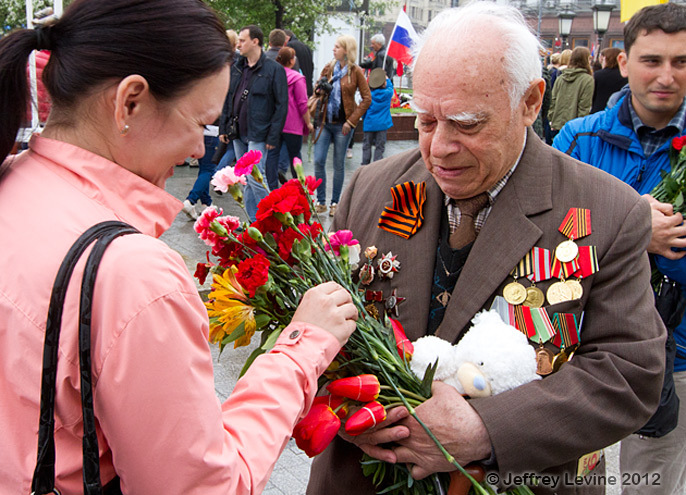 The country fought for 6 bloody years and lost millions of civilians and soldiers, and throughout Russia and much of the former Soviet Union there is an outpouring of patriotism. My goal for the trip was to photograph elderly WWII veterans who come to display their uniforms and medals. 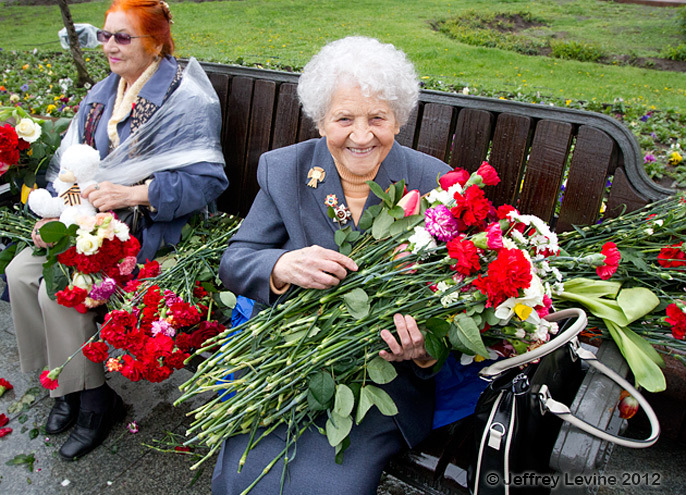 What I found was an amazing and touching public tradition of honoring the older generation. 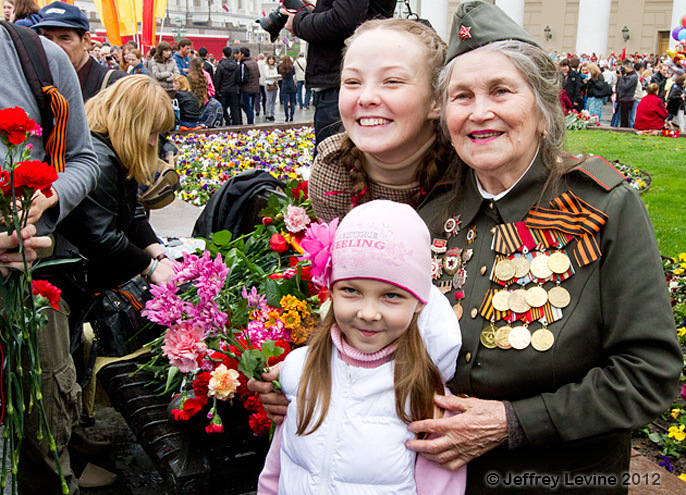 Victory Day in 2012 was two days after Vladimir Putin's inauguration and there was a heavy military presence. In the days leading up to the event I watched as demonstrators were hustled away by police in riot gear and taken away in crowded vans. On Victory Day central Moscow was locked down and many streets and subway stations around Red Square were closed. 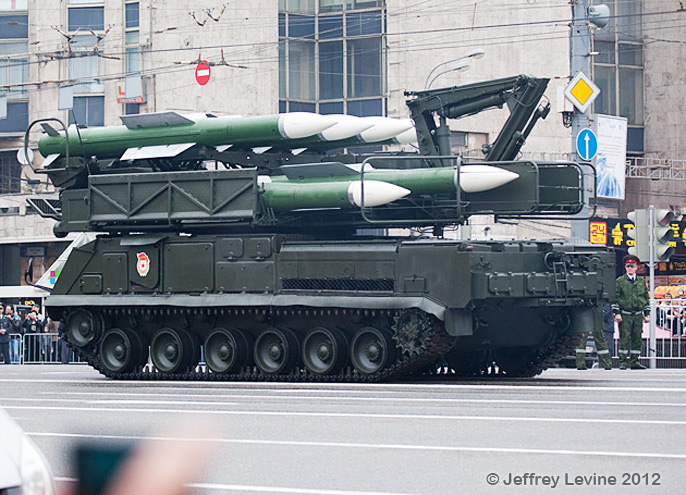 I was able to get to Tverskaya Street, a wide boulevard where a parade of tanks and mobile missiles passed cheering spectators. Afterwards I went to the plaza in front of the Bolshoi Theater where a large gathering was taking place. 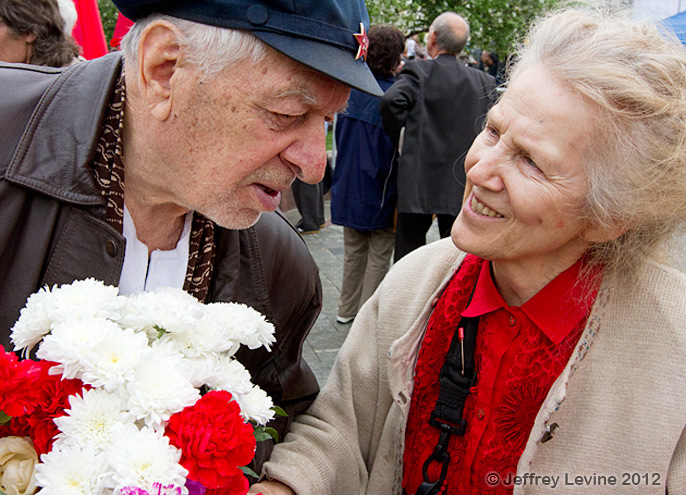 The custom is to give flowers to the elderly veterans and older citizens of the generation that defeated the Nazis. Most looked proud, some looked lost, some cried, and some sang songs or recited poetry. There were lots of hugs and serious catch-up on gossip. They shared sausages and vodka, memories and tears. Some brought their wartime picture albums, proudly showing off photos of themselves in the prime of youth. Circles formed around accordion players and people danced, the music reflecting the wartime spirit from another time. Many veterans were in full dress uniform, their chests covered with medals. Parents ordered children to stand next to them for photos, and often the kids were stiff with fright. Some veterans told war stories while wildly gesticulating with their hands as crowds gathered around to listen. Flower by flower, the elders received so many that they were impossible to carry. Some had friends or family to carry them, some had small carts, and some had nobody to help them. Late in the afternoon red flags fluttered as they packed their picnic baskets and flowers to head home. 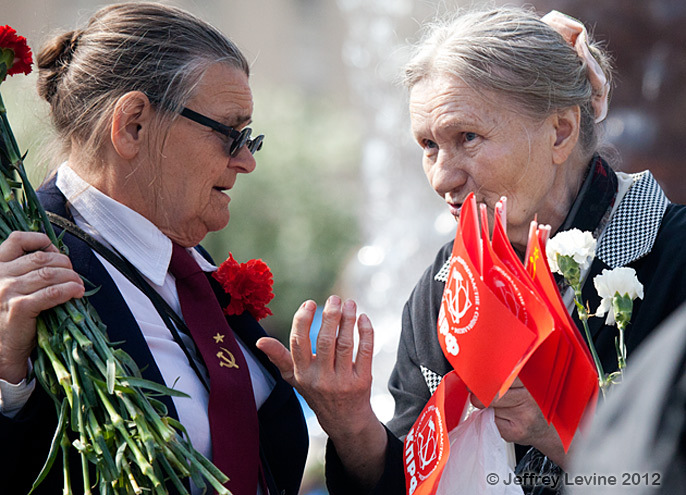 A serious looking woman wandered in circles while hugging a portrait of Stalin. In the distance the sun reflected off the arsenal tower of the Kremlin. 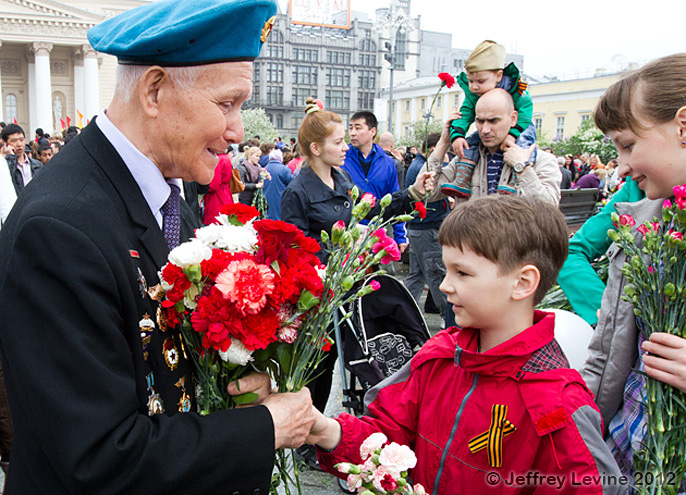 As I turned back to my hotel I wondered how many veterans will be around to celebrate Victory Day next year to pass on the memories. Follow me on Instagram @jlevinemd, and see more art and photos on my blog. Dr. Jeff Levine’s photography exhibit entitled “An International Celebration of Aging” will be at the University of Michigan Medical Center from June to August, 2015 as part of their Gifts of Art program. Lovely. As my mother liked to say, "Bring flowers while I'm alive to enjoy them." But do you realy think thay should be undefinitely proud of Stalin ??? Thet is something definitely wrong on this picutre.